Recently we were approached to review a series of 3 books called Clever Tykes and today we are thrilled to share our review of these fantastic books. What are the Clever Tykes Books? 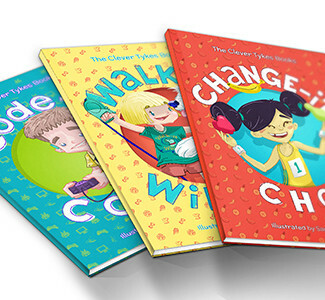 Clever Tykes, a series of three storybooks for primary school children has been bringing positive entrepreneurial role models to the classrooms of over 50 schools across the UK, and is now available for the home. The stories follow three separate protagonists as they each realise that there is something they are especially good at or passionate about, and they set about making this into their own venture. 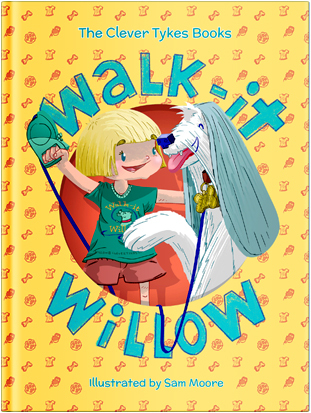 Included in the series is Walk-It Willow, a girl who loves dogs and turns her passion into a service for neighbours; Code-It Cody, a computer whizz-kid who gets a chance to create a computer game of his very own and Change-It Cho, who is determined that healthy eating and exercise should be for everyone. The Clever Tykes entrepreneurial messages are subtle, whilst numerous valuable life skills important to learning and development, such as innovation, independence, goal-setting, hard work and resourcefulness are promoted. Fantastic reading books in their own right, the Clever Tykes stories also incorporate the target literacy and numeracy skills for the specific Key Stage two age-range. “Clever Tykes storybooks aim to introduce important life skills to young children through positive entrepreneurial role models”, commented founder Ben Cook. “We’re passionate about raising aspirations in children everywhere through enterprise education, and we want to make sure that children, whatever their background, believe in themselves and excel in whichever career path they choose”, he added. Children are inspired by characters they know: their parents; teachers; the people they meet and the people they see on TV or read about. Clever Tykes is passionate about using stories to promote important skills and characteristics in children as they grow-up, and to give young kids the opportunity to be inspired and empowered to believe that they can go on to have a successful career that they love. 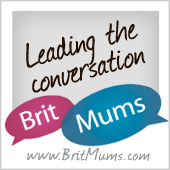 Find out more about Clever Tykes here. So what did we think of the Clever Tykes Books? Both as a parent and teacher (of the target Keystage) I was extremely impressed by this series of books. They are beautifully presented, extremely accessible for all literacy levels (set at a reading age of 8), even the font used is perfect for promoting literacy development. We loved the characters in each of the books and felt that we really got to know Cody, Willow and Cho. They were all very normal, everyday children, going about day to day life, endeavouring to find appropriate solutions to obstacles or tasks they encounter along the way. Problem solving is something we spend a lot of time trying to develop through school curricula and I particularly love how these books show the process involved in making good decisions and problem solving. I was also struck by how the creativity of children is celebrated in this series. Often I feel that children aren’t given enough credit for or opportunity to have an active role in finding solutions for issues that affect them. Throughout this series the characters are encouraged and supported to develop their ideas, face challenges and show that their ideas are valuable, important and of benefit and use to the wider community. 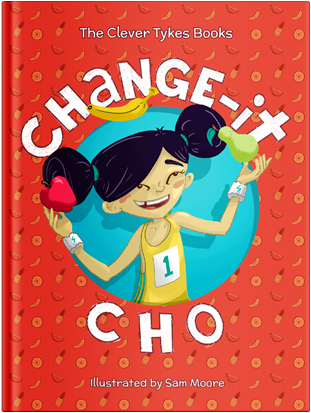 Each book is teeming with positivity. All characters are relatable to, whether it’s a teacher, one of the main child characters or the people in the wider community that they encounter – effective children’s books need to be relatable, need to be based in real life situations in order for many readers to gain full benefit from them. (Don’t get me wrong, there is huge value in fantasy and otherworldly type literature for children especially in terms of developing imagination however, particularly in the case of reluctant readers, real life based stories are often what captures their attention most as they can connect more readily with the content). While my own children are only at Keystage One (4 and 6) they really enjoyed the books. 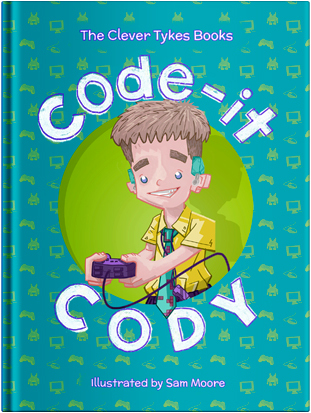 They sparked lots of discussion and Code-It Cody was a huge hit with my 6 year old son who is dying to be old enough to join a local coding club so that he can become an “inventor” and develop all sorts of “programs and robots”. I loved the fact that Cody’s hearing impairment isn’t portrayed as something that may hold him back but rather is used as a means of showing how children are so creative in how they adapt to their surroundings, situations and abilities. We loved the books and found them thoroughly enjoyable. I am returning to my teaching position later this year following my 3 year sabbatical and I am really looking forward to using these books with my own students. All teachers love additional resources and supports for texts used in class and the Clever Tykes website offers fantastic support materials to the series (details and links below). We are delighted to give the Clever Tykes series and firm thumbs up! Super books! Really good value for money! Very accessible and enjoyable for all readers! We loved them!!!!!!! Clever Tykes (RRP £7.99 each or complete series of three stories for £19.99) are available to purchase from www.clevertykes.com and are also available from Amazon and Waterstones. Thank you Ben, Jodie and Jason for sending us these books, we loved them! Disclaimer: I received a full set of the 3 books, free of charge, in exchange for an honest review. Aside from extracts from the promotional material provided by Clever Tykes explaining the purpose and origins of the series, all thoughts and opinions are my own.